Structural inequities keep some neighbourhoods “locked in a context of disadvantage”. Health equity means all people have a fair chance to reach their full health potential and are not disadvantaged by social, economic, and environmental conditions. Community design and the services and resources provided within them, directly influence people’s wellbeing. A commitment to health equity means planning communities to support the health of all its members including children and youth, older adults, newcomers, Indigenous groups, families impacted by low-incomes and people living with physical or mental health challenges. 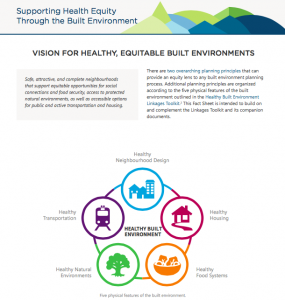 Developed for the BC Centre for Disease Control, with the support of the Healthy Built Environment Linkages Toolkit Working Group the report and factsheet examine how health equity is influenced by the built environment, and how interventions can support or undermine health equity. Adding to the BCCDC Equity and EPH handbook, it provides concrete actions that local governments can take to support health equity through the built environment.